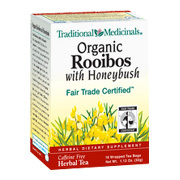 Organic Rooibos with Honeybush is a healthy and refreshing, caffeine-free, beverage tea with significant antioxidant capacity. All of the herbal ingredients in our Organic Rooibos with Honeybush contribute to its antioxidant activity and provide an alternative to caffeine-containing teas like black tea, green tea and maté. For maximum benefit, medicinal tea must be properly prepared. Pour 8 oz. freshly boiled water over a tea bag in a ceramic cup. Cover cup and steep 5-10 minutes. Water temperature, covering your cup and steeping time greatly influence the yield of beneficial components that will end up in your teacup! Gently squeeze the tea bag to release the remaining extractive. Drink 3 cups or more daily. Organic Rooibos w/ Honeybush - is shipped in a discrete, unmarked package. Orders are processed immediately and usually take about 3 to 5 working days to be received. We do ask that you try it for 2 to 3 weeks to feel the full effects. Any information received is used only for order processing and shipping purposes. Your information, such as e-mail address, will never be disclosed to a third party.